Art has always been an important part of human existence. Over time, individuals have taken great pleasure from beautiful things and sought to acquire lavish personal collections. The first known cases of individuals seeking to accumulate art collections were in Hellenistic Greece more than 2,000 years ago. The Attalids are usually considered the first art collectors and went to great lengths to acquire as many artworks as possible. King Attalos II of Pergamon is well known for his collection of paintings and for having brought back from the Island of Aegina a number of works of art to decorate the city of Pergamon. Eventually, collecting reached Rome, becoming widespread among wealthy Romans who were especially keen to acquire works of Greek art. Hadrian was himself an enthusiastic collector of art. His villa at Tivoli housed an enormous quantity of sculptures which later formed the nucleus of major European and North American sculpture collections. From the 17th century on, many beautiful artefacts were unearthed at the site and were collected by antiquities dealers such as Piranesi and Gavin Hamilton to sell to antiquarians. 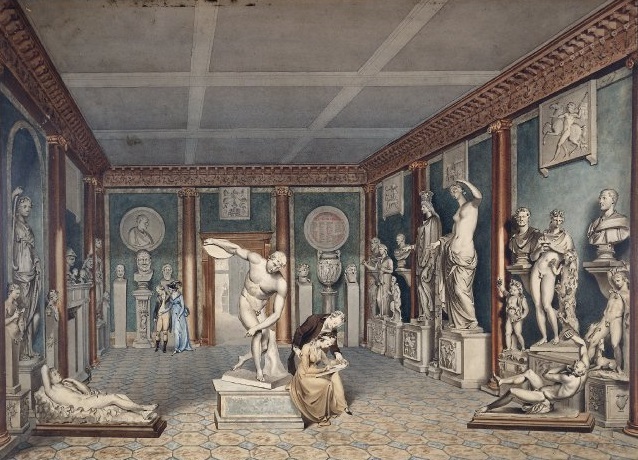 Among the antiquarians was Sir Charles Townley whose collection was bought by the British government in 1805 and became the basis of the British Museum’s Greek and Roman collection. Another famous collector of art and antiquities was J. Paul Getty. His collection formed the basis of the J. Paul Getty Museum in Malibu, California. Above all, Getty preferred to acquire antiquities previously owned by Hadrian or by 18th-century English aristocrats. This was the case for the Lansdowne Hercules, a sculpture excavated at Hadrian’s Villa in 1790 which he purchased from the noble English Lansdowne family who owned a fine collection of classical sculptures including the Lansdowne Relief and the Lansdowne Antinous from Hadrian’s Villa. However, many private art collections that contain countless of treasures and masterpieces are often hidden away from public view. Thankfully for us, a few collectors make the effort to display their objects in a museum or in temporary exhibitions and generously share their personal collections with the community. Such is the case with the “Eclectic, a collection of the 21st century” exhibition in the renowned Parisian museum, the Musée du Quai Branly. The exhibition, running until April 02, 2017 sheds light on the stunning private collection of the French art collector and businessman Marc Ladreit de Lacharrière. Ladreit de Lacharrière started assembling his collection in April 2003 focusing on non-European arts and is made up of a selection of eclectic artworks from the Cyclades as well as Roman sculptures. The exhibition is presenting a selection of masterpieces from Ladreit de Lacharrière’s varied collection showing the collector’s diverse interests. 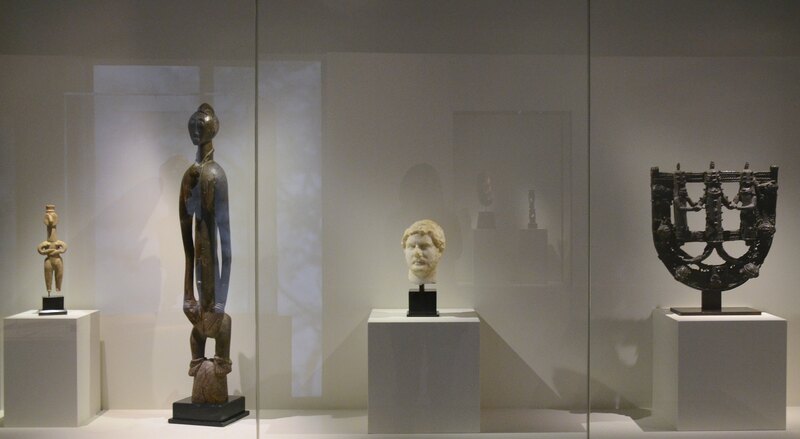 Among the objects on show is a small marble head of Hadrian standing side by side with an 18th century female statue from the Ivory Coast and a 18th century figurative plaque from the Kingdom of Benin. 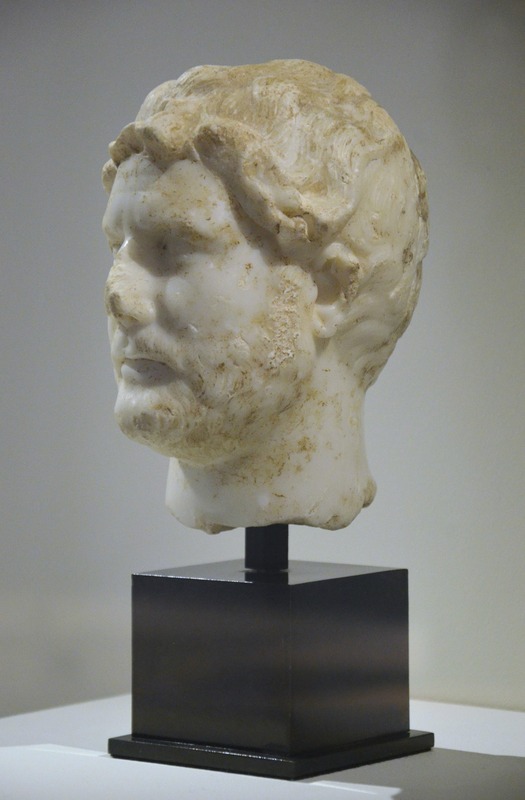 This small head of Hadrian represents the emperor at the height of his power. The portrait is attributed to the so-called “Imperatori 32 type”, one of the six sculptural types attributed to the extant corpus of Hadrian portraits by M. Wegner, a German specialist on Roman portraiture (a seventh type was added later on by Cecile Evers). 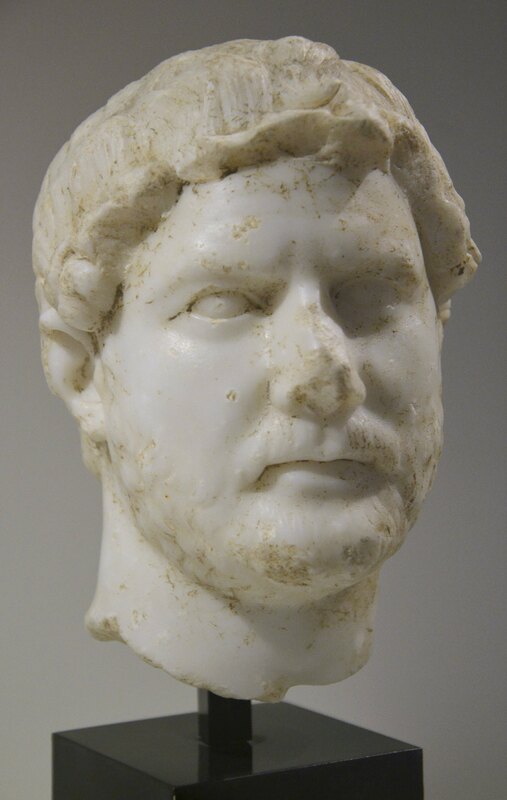 Approximately 160 examples of sculpted portraits of Hadrian have been found to date, and the “Imperatori 32” type was a type popular in Italy and in the provinces (most notably in Greece and in North Africa). More than 30 replicas of the “Imperatori 32” type are still in existence today (see the ones I have collected here). 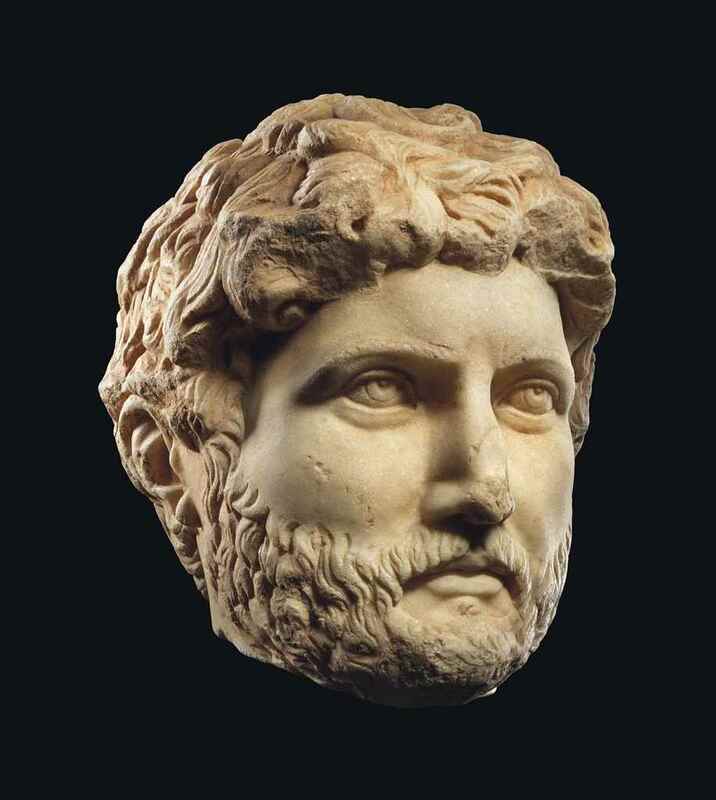 The restrained carving of the forehead endows Hadrian with a youthful and idealised appearance. With the head turned to the right, the “Imperatori 32” type is distinct for its two rows of locks above the temples, its forehead with two parallel wrinkles, its narrowed eyes with uncarved pupils. The “Imperatori 32” type was created in 127/128 AD for Hadrian’s decennalia (celebration of ten years of an emperor’s reign) and his acceptance of the title Pater Patriae (Father of the Country). It is also in 128 AD that Hadrian received in Athens the title of Olympios, directly linking him to the great god Zeus. 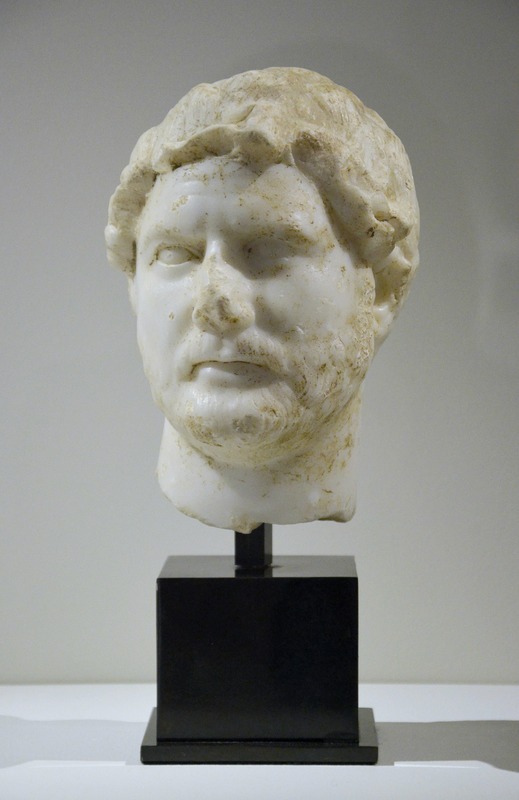 Many portraits of Hadrian have been sold at auction through the antiquities trade and auction houses. 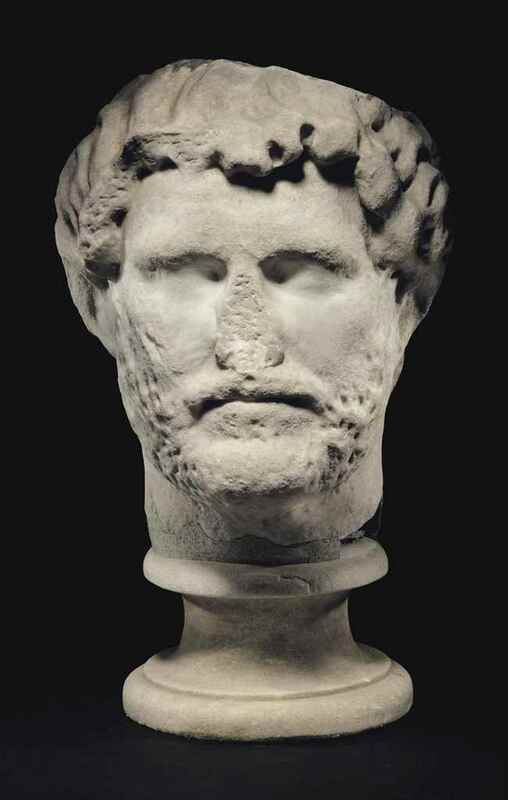 In 2014, an impressive head of Hadrian that had been in the same private collection for over half a century was sold for €900,000 (€1,116,000 with buyer’s premium) by Tessier Sarrou & Associés at Drouot in Paris. Entered with an estimate of €150,000-200,000, it was pursued to five times that level. In this impressive and remarkably well-preserved portrait, Hadrian is wearing a laurel wreath. The crown is adorned with a central medallion, probably originally painted with an eagle, a direct allusion to Jupiter. The head was part of a larger-than-life statue. As for the Ladreit de Lacharrière’s head, this portrait of Hadrian was attributed to the “Imperatori 32” type. Both heads were an early example of the “Pater Patriae” type as the eyes have not yet been incised, a technical novelty that was first used in this same portrait series later on. Tessier Sarrou & Associés auction house, sold on 30 April 2014. In 2008, a full-length marble statue of Hadrian known as ‘the Cobham Hall Hadrian’ was bought during an auction at Christie’s Auction House in New York by British collector Christian Levett who put it on display in his Museum of Classical Art in Mougins in the south of France. Estimated by the experts at Christie’s to be worth between $350,000 and $500,000, the sculpture fetched $902,500. The Cobham Hall Hadrian was formerly in the Villa Montalto-Negroni-Massimi in Rome and was acquired in the late 18th century by John Bligh, 4th Earl of Darnley, for his home Cobham Hall in Kent, England. The statue was then acquired at Sotheby’s in 1957 by New Orleans collector Wilson J. Raker who sold it to IberiaBank in 1961 for $3,000. For more than 40 years, the statue was placed in a garden on the IberiaBank property in New Iberia in Louisiana. It became a tourist attraction and a landmark to the city. Hadrian’s Iberian ancestry was the inspiration for the bank’s acquisition. Hadrian statue encased in a glass enclosure in New Iberia in 2006. 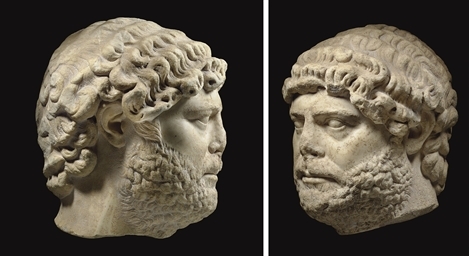 A few more portraits of Hadrian have recently been sold at auction through Christie’s.